The Princess (my 8-year-old) is quite the mini-fashionista. So when it came to decorating her bedroom, we thought that fashion inspired art would be a good way to go. I had been admiring the vintage Barbie Fashion Sketches that I had seen here and there in catalogs and on-line, but the price was a bit steep. So I was trying to figure out a less expensive alternative when I happened upon this calendar at World Market. The minute I saw it, I knew EXACTLY what I was going to do with it. (I would have really loved to use it for our yearly calendar, but the boys in the family might have protested a bit.) 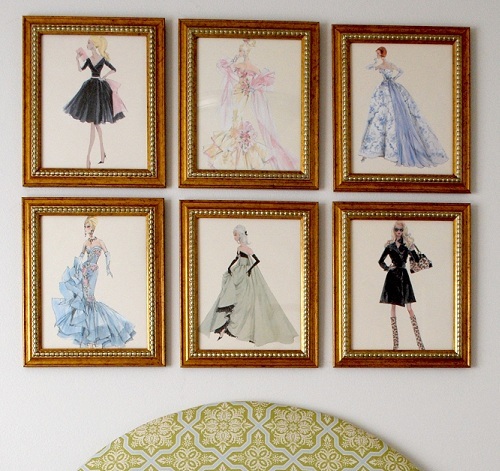 I decided to use it to create Barbie fashion art for the Princess' bedroom. So many adorable illustrations! It was hard to narrow them down. The images are calendar-sized, obviously, so I wanted to do a sort of gallery/grid to give the art more presence. The Princess had fun choosing her 6 favorite illustrations to frame. We chose gold frames for a girl-goes-glam look, and framed them up. Then after careful measuring, we hung them above her bed. They look perfect! I hope these little peeks at the Princess' bedroom are fun to see because her bedroom is almost finished. I'm just waiting for some fabric I designed to arrive so that I can make the bedskirt, pillow sham and curtains. Then I'll post the big REVEAL!! Can't wait to show you!! Love the Barbie sketches! What a fun and affordable idea! Thanks for sharing. How cute and what a great idea..Can't wait to see the finished room..
Super cute idea! I loved it so much that I ran out to my local World Market this evening and purchased that exact calendar. I was pleasantly surprised to find that all of their calendars are 75% off this week! I paid just under $4 for this little lovely :) Thanks so much for the inspiration! Awesome idea! I've done this before as well- found an amazing calendar and turned it into art. Great job and what a lucky little girl! They look beautiful in the gold frames. I did this in our little-peanut's nursery with original Winnie-the-Pooh prints. This is just so adorable, and not at all too commercial. Just perfect, I might have to steal this idea for my daughter's sophisticated princess room. Thanks for sharing!